Titanium Blockchain Partners With Neblio! 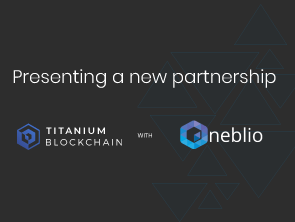 Titanium blockchain is happy to announce that it has partnered with Neblio! Neblio is a next generation, Proof Of Stake (POS), enterprise blockchain platform, founded in 2017 by Eddy Smith and Ann Jackson. Neblio recently upgraded its main-net to be one of the fastest in the world with a 30 seconds block time and 8MB block size. With Neblio’s own token protocol called NTP1, Tokens can be easily created at: https://orion.nebl.io and have the ability to store metadata as well. We are excited about the partnership with Neblio. It will expand our reach, by giving us the ability to program in more languages, and by lowering our clients barriers to entry for Blockchain. Neblio based projects will be able to use our experience and services to launch their projects and conduct ICOs/STOs easier and faster. As part of this partnership we are offering Neblio projects free Consulting. In addition, we will give a 10% discount to projects coming from Neblio on Research & development services. Projects interested in exploring this opportunity should contact the Neblio team so they can make the introduction. The partnership with Neblio is an important step in growing our blockchain innovation ecosystem, and taking it to the next level.